Print media: High-res TIFFs - colour, black/white. 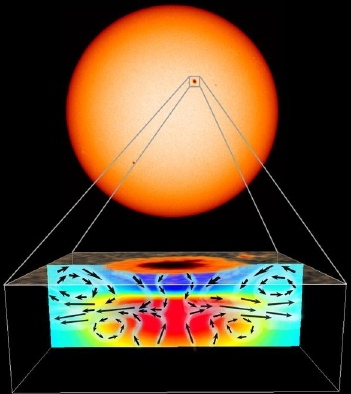 Caption: Truth be told, no everyday word covers this phenomenon adequately, so bear with us: Concentrated magnetic fields like the ones necessary to form a sunspot will, when left to their own devices, dissipate. So, a longstanding problem in solar physics has been to explain how sunspots can last for several weeks without flying apart. Theories have been developed that require inward flows of material that stabilise the structure. The problem: Material often appears to be flowing out of sunspots! Now, a team using a novel method called acoustic tomography have shown that the models got it right! The method can be thought of as a way to infer the obstacles and terrain that have faced an ensemble of cross-country runners, based on their time of arrival at various locations. Here, the runners are packets of sound waves, the obstacles and the terrain are local variations in temperature, magnetic fields and gas flows beneath the Sun's surface. The analysis reveals intriguing details never seen before, answering yet another puzzle about sunspots, blemishes on the Sun that have been a source of wonder to mankind ever since they were described (and drawn in painstaking detail!) by Galileo, 400 years ago. The animated drawings of the Sun in the movie above are original works by Galileo. 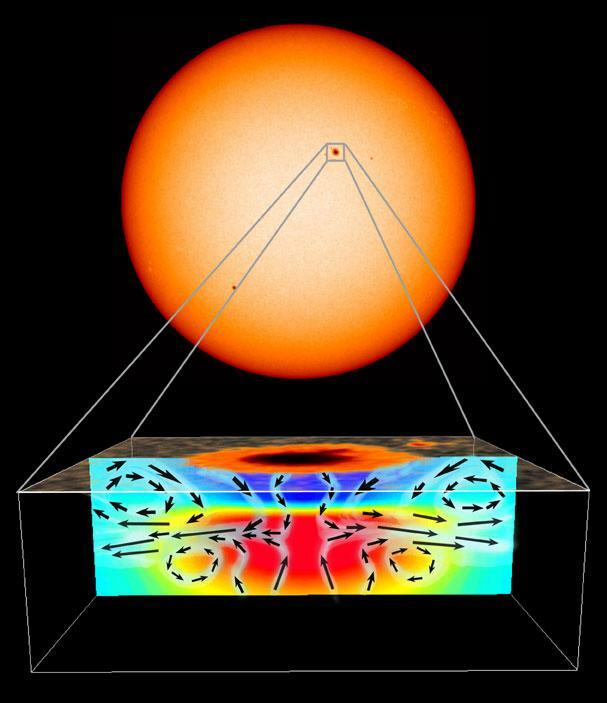 The other images and movies above show, in various ways, MDI observations from 18 June 1998 of a stable sunspot and the inferred structure below the visible surface, including cooler (blue) and hotter (red) material as well as the flow fields (arrows). For a full explanation and story, follow the related links below.